UK purchasing costs are a key source of profit for caterers. This report is centred on the key theme that customers in the UK are unaware of the true cost of purchasing for their catering providers and that purchasing is subsequently an important source of profit margin for the catering industry. While discounts and rebates are certainly a factor here (they serve to mask the true picture) this is not just a case of the catering companies capitalising on their purchasing power. Dedicated purchasing specialists believe that they can typically save 15% on a customer’s purchasing costs by taking over this part of the catering function. (Given undoubted scale benefits, this suggests that the actual cost of purchases for the catering companies is more than 15% lower than the charge levied to the customer). The purchasing specialist looks set to flush out these excess profits from the industry, reducing subsidy levels in the process. Risks: Customers will need to embrace this opportunity Perhaps the biggest risk to our analysis is any reluctance from customers to enforce this change given historic relationships with their catering suppliers and a fear that purchasing specialists will somehow provide an inferior service. It is our belief that a significant proportion of the margin within UK catering companies is coming from rebates received from suppliers and that customers are, in many cases, not fully aware of the scale of these rebates and hence the true underlying purchasing cost for the caterer. Profits are made through the receipt of rebates and these rebates remain a key component of profitability within the UK catering industry today. It has become clear from our discussions with industry participants that customers in the UK remain largely ignorant as to the true underlying cost of purchases. However, it appears that in many cases, the purchasing costs detailed by the catering company are not an accurate reflection of what the caterer will actually face. In part, this is due to the rebates received but in addition, the caterer is simply looking to make a mark-up against the standard price, thereby boosting the resultant margin. The problem for the customer is that they do not want to face the hassle or additional resource requirements to take the purchasing activities in house and deal with the multitude of supplier relationships and invoices. For the time being, Finance Directors appear to be far-removed from this process and it appears that customers are still financially naïve in their procurement process. If this resistance to change can be overcome, the next step to consider is the outsourcing of the purchasing function to dedicated specialists – thereby removing the ability of the catering company to make any margin on this function whatsoever. Purchasing specialists are looking to slash customers’ costs… This report has been written post discussions with one of those purchasing specialists referred to above – a private company called Partners in Purchasing. The business was set up in December 1997 and the two founding directors both gained considerable experience in hospitality roles with leading contract catering companies – both as operators and purchasing specialists. The prime activity of the company is the management of purchasing costs with a typical goal of reducing such costs by 15-20% (more on this later). The company currently manages a purchasing expenditure of around £30m (of which approximately 70% is food-related and 30% is for non-consumables). Partners in Purchasing operate on behalf of financial institutions, government offices, independent contract caterers, universities, residential/nursing homes and industrial clients. In addition to purchasing management services detailed in Figure 1, a consultancy service is provided to three customers within B&I and one in the public sector. On entering into a new relationship with a customer, Partners in Purchasing will analyse a typical month’s worth of invoices, the list of suppliers currently used, the annualised spend with each supplier together with any discounts or rebates that may exist. When a full understanding of the purchasing requirements has been reached, Partners in Purchasing will look to take on the purchasing function from the incumbent operator, providing a single invoice across the entire spectrum of catering purchases and promising that any discounts negotiated are returned to the customer. How does this impact the role of the catering company? With Partners in Purchasing now in full control of purchasing requirements, the role of the contract caterer is limited to the provision of the physical catering services (preparation, service etc). Partners in Purchasing argue that the on-site team from the incumbent catering company is often very comfortable with external purchasing managers arriving. They believe that the dialogue they have with the catering personnel is often more fruitful and encourages greater input from those on-site employees than they might actually have with their own in-house purchasing department. However, it doesn’t appear that the catering company itself will be desperately pleased since its role; revenues and profit potential are all significantly reduced in the process. We seek to illustrate this in Figure 2 through three examples. In Example A, we have a typical catering contract that investors will be familiar with. The catering company receives income in two forms, namely till receipts and any subsidy (which for illustrative purposes only here we have assumed is 25% of the total pot but in reality will vary significantly from contract to contract). This total income covers supposed purchasing costs together with all other costs (labour etc.) and leaves the catering company with a margin (in this case, we have assumed 5%) as we detailed earlier. In Example B, we have illustrated the exact same contract but in this case assume that the true cost of purchases is, as Partners in Purchasing claim,some 15% lower than the catering company is claiming. 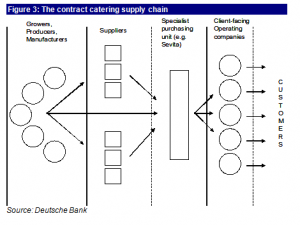 This scenario illustrates the significantly higher margin of the catering company. Finally, in Example C, we have taken the contract to its next stage. In this instance, the purchasing activities have been fully outsourced to an alternative provider, with the catering company receiving significantly reduced revenues to cover the remaining costs and a ‘management fee’. We have also illustrated that a shift from Example B to Example C would lead to an estimated 37% reduction in the catering company’s revenues and a very significant 53% reduction in EBITA. This potential profit reduction sounds pretty worrying but while we do feel it is right for investors to be cautious over profit developments in the UK catering industry, there are a number of other issues that need to be considered. The first of these is the claim that Partners in Purchasing can extract a 15% saving in purchasing costs. How can Partners in Purchasing by more cheaply than the caterers? The simple answer to this question is that they can’t. Partners in Purchasing are currently managing UK purchases worth £30m, versus our estimate of £748m at Compass, £305m at Sodexho and £58m at Elior (each estimate is for UK contract catering activities only). In other words Partners in Purchasing is spending 52% of what Elior spends, 10% of what Sodexho spends and only 4% of what Compass spends in any one year. As such, purchasing specialists will never be able to match the catering companies in terms of scale and purchasing power. The 15% saving simply reflects the difference between what catering companies are actually charging their clients for purchasing versus the actual cost for Partners in Purchasing. The actual cost for the catering companies themselves should be lower still. As such, the analysis in Figure 2 is actually underestimating the margin that catering companies are making on their purchasing costs. It seems illogical to us that customers will sit back and allow the catering industry to retain current levels of profitability. We believe that the evolution of the third party purchasing specialist could prove to be the catalyst that will ignite this change. Have UK catering companies had it too good for too long? On 25 November, 2004, we wrote a report entitled, European Catering – Blowing the lid on purchasing. We have been surprised by the interest this report appears to have generated and have subsequently held a number of meetings with a range of UK industry participants, with a view to unearthing more detail on the purchasing conundrum. In our original report, we argued that UK caterers are making excessive profits from purchasing activities – in other words, the true cost of purchasing is some way lower than what many customers are led to believe. The overriding message that we have received post publication of this initial report is that the scale of this problem is some way greater than we originally thought and that the leading UK catering providers could come under some revenue and/or margin pressure as customers pursue opportunities to reduce their own costs. The UK catering industry is largely consolidated between the four big players (Compass, Sodexho, Aramark and Elior) and our suspicion is that consultants have had only limited success at extracting the real savings that customers arguably deserve. Consultants could argue for one thing while the catering industry would deny any wrongdoing and simply claim that the consultants’ advice was misplaced. In many instances, a deadlock situation arose, with the customer stuck in the middle. That is why we found the Partners in Purchasing story so interesting since here was an organisation willing to physically take on the purchasing function, thereby acting as a real alternative. Within Compass, there exists a Commercial Services division, headed by Chris Bucknall, which is responsible for global purchases of around £5.0 billion, of which over £3.5 billion is on food. This has been a huge success story at Compass as the company has grasped control of the supply chain right back to the producers and growers. Compass’ scale and innovation around purchasing undoubtedly allows the company to buy more cheaply than its peers. However, our understanding is that the Commercial Services division then ‘sells’ this produce to its client-facing operating companies (Surest, Restaurant Associates, etc.) as well as to other purchasing consortia, taking a margin in the process. (Compass doesn’t quite agree with this description and argues that the specialist purchasing unit simply buys on behalf of the client-facing operating companies, with the benefits of purchasing power being pushed back to those operating companies to ensure that they are all incentivised to use the preferred suppliers). Exactly what prices Compass’ purchasing units pay remains something of a mystery and the company has been unable or unwilling to give us an indication of the potential benefits of scale. How has the industry managed to ‘pull the wool over customers’ eyes’? Those who doubt our argument thus far are probably asking how the industry could possibly conceal what the true cost of the catering operations actually is. The answer is twofold. First, the smarter catering companies started to grapple with the issue of purchasing and supply chains some time ago, achieving efficiencies that their customers had not imagined possible while the catering function was in-house. As such, although the UK model centred on a cost plus contract model, the full extent of the savings was never made clear to customers, many of whom remain ignorant today. Second, it can be very difficult to track what the fair cost of certain purchases actually is. One consultant we have spoken with argued that cleaning materials and disposables were typically the source of greatest mark-up (certainly it appears nigh impossible to accurately track the level of dilution being used for cleaning chemicals). However, Partners in Purchasing argues that fruit and vegetables and, to a lesser extent, fish purchases are the most difficult to verify simply because the underlying prices swing so markedly from day-to-day. Cost plus contracts are stacked so ridiculously in favour of the catering company that customers only have themselves to blame. We accept that in an ‘open-book’ type arrangement, excessive profits should be avoided and to that end, customers will rightly feel cheated in the event that certain costs have been artificially inflated. 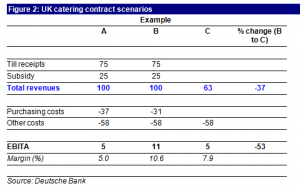 However, any cost plus contract reduces the risk for the caterer to such an extraordinarily low level that the customer should be asking is the outsourcing option actually worth it? Any cost plus contract should, of course, contain cost reduction targets with penalties imposed on the caterer in the event of cost overruns and bonus payments kicking-in should cost saving targets be exceeded. The reason why we feel there will be some resistance to change, even in the event that a customer begins to appreciate the true profit being made by the caterer is as follows. This is an industry driven by personal relationships, many of which have been in place for years. As such, the facility services director who has been wined, dined, taken to the rugby internationals or whatever, may be reluctant to enforce change. In addition, why would the facility services director want to highlight to his or her senior managers that the catering contract that he or she negotiated just a few years earlier was in fact grossly mis-priced? Finally, facility management companies have grown in importance as they co-ordinate the provision of outsourced functions across a range of services. These facility management operators may well wish to shield the end customer from any excess profits within the catering service, taking a slice of the profit for themselves, but leaving enough for the catering company whom they need if they are to offer the full breadth of solutions for their clients. This entry was posted in Uncategorized and tagged Catering, Costs, Purchasing, Purchasing investment thesis. Bookmark the permalink.